Read Trent Walter's interview with Mary at SF Site. 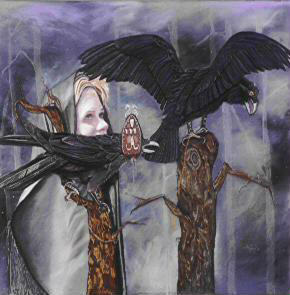 The cover art for the book, shown to the left, is "Merglenn's Rooks," a pastel painting by AB Word, Copyright 2000. Now in a private collection. Jack McDevitt "Brilliant and passionate. Hard-edged, glittering rides through the dark." Kara Dalkey "Mary Soon Lee invokes her characters with such humanity, no matter how fantastical their circumstances, that they seem to effortlessly come to life. Her lovely, lyrical prose is likely to make readers feel they have been dropped into a dream from another world -- a world potentially as real as our own." 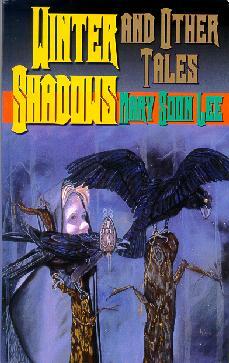 Vera Nazarian "Mary Soon Lee knows how to write intense human stories in the trappings of fantasy and science fiction." Terri Windling, Year's Best Fantasy & Horror #15, August 2002 "... an interesting mix of genre stories..."
Ellen Datlow, Year's Best Fantasy & Horror #15, August 2002 "... a good introduction to the author's work. Several of the twenty stories of science fiction, fantasy, and horror appear in this debut collection for the first time..."
Cause and Consequence A man travels back in time to meet Jane Austen - Winner of the Best of Soft SF award. Vigil War is coming: Branwen must settle the souls of the dead soldiers. Mail-a-Day Mail every day? Is that the answer to a woman's loneliness? The Three Kingdoms Sir Alaric's quest to find a bride - Received an Honorable Mention in the Year's Best Fantasy & Horror #12. Roadside Stop "Bill left home on a Tuesday night in the pouring rain..." - Received an Honorable Mention in the Year's Best Fantasy & Horror #12. The Hollow Dancer The night before the battle, Hellia had to dance with the enemy. Conversation Pieces Maybe you talk to objects sometimes, but what if they answered back? Spell Night First time in print - My only cat story to date. Seeing Deeper A hard birth, and harder days after. Gift My first published story. Not Another Unicorn A witch is infuriated by her customers' demands for exotic creatures. Heron "Heron arrived at the Goddess's temple when she was seven years old..." - Received an Honorable Mention in the Year's Best Fantasy & Horror #12. Puppetta A wooden figurine half-remembers a time before she danced at a magician's command. The Fall of the Kingdom An old, old story revisited - Received an Honorable Mention in The Year's Best Fantasy & Horror #15. Dragonslayer A girl glimpses glory when a dragonslayer comes to her village. City of Mercy First time in print - In a city inhabited by murderers, Ismet chooses her destiny - Received an Honorable Mention in The Year's Best Fantasy & Horror #15.